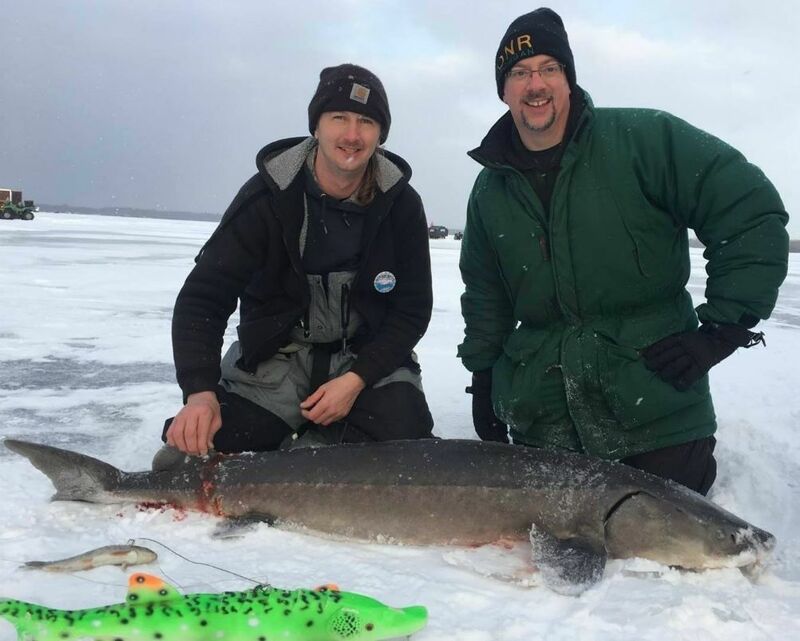 This year’s sturgeon season on Black Lake (Cheboygan County, Michigan) ended at 9:18 a.m. Saturday, February 2 — after only 78 minutes of fishing. The fishing season, which included spearing or hook-and-line fishing, was scheduled to run February 2-6, 2019, or until the harvest quota had been reached. This year's allocation of sturgeon for Black Lake anglers was seven fish, although Department of Natural Resources (DNR) officials set a harvest quota of six fish. There were 403 registered anglers on the ice February 2, slightly down from 422 the year before. Anglers of all ages again participated, including a good number of supervised youth. Fishermen can use hook and line or spears to harvest a Black Lake sturgeon. The one shown here was taken by spearing; you can see the spear marks in front of the fish's tail. Sturgeon are lured beneath a spear hole with large decoys such as the bright green one shown above. Three of the six fish taken on February 2, 2019 from Black Lake had been captured before by Michigan State University and the DNR during spring spawning runs in the Black River. A harvested 56-inch male was captured in the 2009 spring spawning run. A 60-inch male had been captured and tagged during the 2004, 2010 and 2017 spawning runs. The largest fish, a 72-inch female, had been captured and tagged during the 2003, 2007 and 2012 spawning runs in the Black River. All methods were used to indicate the season’s end within minutes of the final fish (sturgeon number six) being harvested. DNR law enforcement officials and other department personnel were walking through the on-ice fishing communities and were able to quickly report harvested fish and contact all participating anglers about the season's close. Kudos to the Michigan DNR for offering anglers a season for this magnificent monster fish. And if you plan to participate during the 2020 season, we suggest you don’t arrive 80 minutes late.